WANT A FREE BOOK? Call for Beta Readers! Hello my lovely Precious Readers! I wrapped up edits for MISSING YOU right now! Yes, RIGHT NOW! Literally right now! What I need now are YOUR EYEBALLS! If you’re interested in an ARC (advanced reader copy), and want to help me out, email me at katherinebacher@gmail.com with the email subject line as: MY BETA. You’ll receive an email with instructions. This is the final step before sending Missing You to the printers for its June 25th release! Thank you for your support! Go Roxy! Special Sale from Oct. 26-30 – Capture Me is FREE, and Crush On You is only $1.99! I have a super-secret-squirrel sale I wanted to let you all know about! My Roxy Summers Mystery Series will be having a special sale on Amazon between October 26-30th. For anyone who has, ahem, perhaps procrastinated in obtaining their copies of my books, this is a fantastic opportunity to catch up with Roxy Summers and the gang, and read up on all of their adventures! Don’t delay in taking advantage of this amazing sale before my third Roxy Summers Mystery book releases in June 2018! Capture Me will be FREE to anyone on Amazon KDP! Crush On You will be only $1.99 on Amazon Kindle! Someone is dishing up trouble. Seattle sweetie, Roxy Summers, kicks off her new career as a magazine feature photojournalist and blogger with her first assignment, covering a Seattle favorite restaurant while they compete in a televised food competition! Next thing you know, with her besties in tow, Roxy hops a plane to Los Angeles. With national fame and fortune on the line, the competition is deadly. With sabotage, a stalker, and a devastating secret that could destroy them all, Roxy soon finds her simple assignment has turned into a twisted labyrinth of betrayal, death threats, and murder. Even worse, Roxy’s personal life is… complicated. Her sort-of-kind-of-but-not-quite relationship with the sultry and brooding Seattle Detective, Charlie Bennett is on the rocks. To add salt to the wound, her former crush and now boss, joins her on the trip. The cherry on top is the reemergence of her cheating ex, crawling back and begging for another chance. Roxy needs to sift through the chaos of her relationships and find the culprit destroying the competition before it gets too hot in the kitchen. Get your copy HERE between October 26-30 for this one-time-only, special deal! Why? It’s because I love all of you. Last night I attended the Passport to Romance: Free Reader Appreciation Event at The Westin Bellevue ballroom. I snagged my girl friend, Caring*, and we drove on down I-405 South. After a week of mostly drizzly rain and bright cloud-covered days, the sky decided to cloud up darkly and dump buckets on Washington residents. Accident after accident lined the crowded freeway. Downtown Bellevue was hopping as we stopped-started-stopped again, slogged through traffic, and parked underneath the hotel. Before heading to the ballroom, we bumped into Jacquie Rogers, Diane Rodes Garland, and CJ Obray. We had a quick chat before riding the escalators up, up, up to the third floor. The ballroom was decorated with bar tables scattered throughout, each featuring an author and their published works, goodies, and freebies! Around the edges of the room were a variety of gift baskets up for raffle. Not having much cash on us, my friend bought 1 raffle ticket, I bought 2. We made our entries for the raffle baskets we were itchy to win. The one I entered for contained a Kindle, books, and a bottle of Jameson that was converted into a lamp. I had my eyes on that Kindle… and created a mental list of people to give the lamp. The proceeds went to GSRWA to keep its operations running smoothly. As the night continued, Caring and I bumped elbows and chatted with some of my favorite local authors, picked up some freebies, including books, bags, bookmarks, pens, candy, chocolate, etc. The end of the event drew near, and they began to announce the winners of the raffles. A line of male cover models presenting each gift basket and prize to the winners. Curses! Foiled again! Alas, it was not meant to be, that Kindle and I. No worries, I figured I wouldn’t win anything. However, there were so many free things, I cannot complain. I even walked away with a free, stemless wine glass. Also, oou may not know this about me, but I am a mass contest enter…er. I am fiercly competitive, but a joyful loser, and often win free book contests! Huzzah! Her solitary ticket, a last minute placement among so many other hopefuls, was picked out of the tiny paper bag! 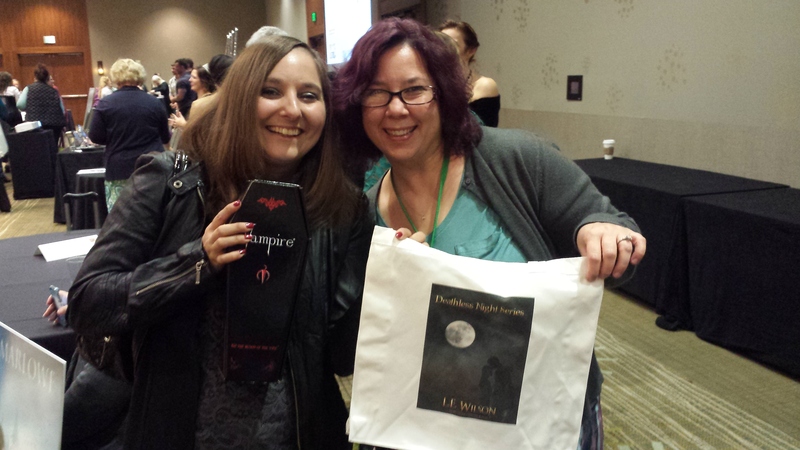 She went home with a gift tote, a bottle of Vampire (chocolate) wine, a necklace, and a few other trinkets of winning glory! Caring and the L.E. Wilson raffle prize! It features the novel Blood Hunger, first in the Deathless Night Series. Me, Caring, and L.E. Wilson! Please disregard the extremely flyaway, frizzy hair of mine. I didn’t have time to curl it, and WA weather is merciless to hair. What a spectacular, fun-filled event! Caring was introduced to countless authors who provide so much literary escape, and I was able to reconnect with some amazing people from RWA/GSRWA! It saddened me slightly that I was unable to keep up with my membership to RWA, GSRWA, and unable to attend Emerald City Writer’s Conference 2015, but I have hopes to attend next year. 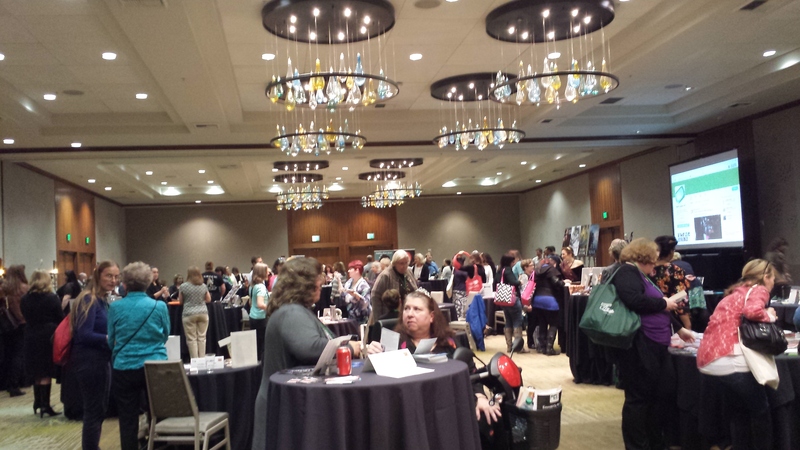 Passport to Romance is a big hit, and I hope RWA/GSRWA hosts one again next year!